Flipped, now we don't have vertigo anymore! I was rooting through my stored stuff at work yesterday, and came upon my tail lights, left anf right, that I bought a few years ago, the final clearance from Nissan. These are complete, with wiring, new nuts, gasket, bulbs. I also have a spare worm and sector for my HL510 box, 1 body trim strip, that goes on the rocker, and my original stock 73' TC rods. I also have these arm rests, but, I'm not sure that they are originals. I think tedman wins for rarity when coupled with usefulness. Only thing more rare would be the quick ratio rally version of that worm gear, which is true unobtainium. Would love to get ahold of one to copy. I agree that Tedman wins for the best part..I just choked when I saw that. I wonder if he has the sector gear that goes with it? freq wrote: I think tedman wins for rarity when coupled with usefulness. Only thing more rare would be the quick ratio rally version of that worm gear, which is true unobtainium. Would love to get ahold of one to copy. Forget about having the rally one found and copied start with this one! Would be cheaper to convert to R&P. I forgot about these Datsun 1600 emblems. The rear quarter window weatherstripping was purchased off ebay and are now on my 510. I was in the garage tonight working on the VG project and found these. 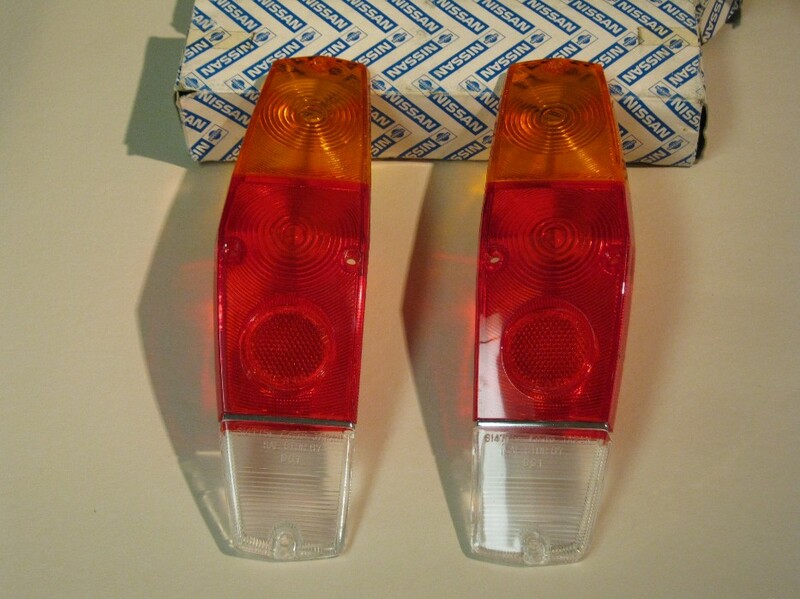 NOS OEM Datsun 510 Wagon Euro Tail Light Lenses. I am about to put them up for sale in the classifieds if anyone is interested. Scored that worm gear assy in one of those annual Nissan Competition Parts Dept clearance sales that they used to have. My buddy at work who used to work for Electramotive was on the mail list and he'd send me the clearance parts lists. I think I also snagged the last set of Comp 510 springs in that sale, a 3.90 R180 R&P, Comp 44mm intake mani, and some T/C kits. Another goodie I picked up from one of the later Nissan Motorsports clearance sales. Bolts right up to the 200mm 6-bolt Tilton flywheel.